Good things are best shared, or so the old saying goes. But for fans of the strong-smelling durian fruit, this is one indulgence that is perhaps best enjoyed alone. However, some good news is that there are several venues in the city that have become veritable paradises for durian lovers with menus featuring the fruit in a variety of styles. Aimee Yang is a big fan of desserts who also likes to create her own dessert recipes for people with a sweet tooth like herself. As a restaurant owner who has been in the business for more than 10 years, Yang devoted herself full time to creating a durian-themed dessert outlet late last year. "The durian is a nutritious fruit and is a favorite of many people, but its odor is unpleasant to some. That's why I am always trying ways to get rid of the smell," she said. After three months of preparation, the store finally opened in January besides one of her other restaurants, Sapori on Jianguo Road West. Named Durianything, the store aims to "give durian lovers everything," in Yang's words. Inside foodies can discover durian cupcakes (20 yuan, $3.24), durian cheese cake (50 yuan), richly flavored durian mousse (30 yuan), and durian caramel pudding (30 yuan) which is topped with white chocolate shavings. All the products are sold to be taken away. A durian lava cake is the only dessert on Yang's menu that needs to be freshly baked when ordered. This five-pointed dessert boasts a crispy coating and a succulent semi-liquid filling. "My choice of which type of durian to use varies depending on the time of year," said Yang. "I'm very strict when it comes to buying the best ingredients. And if I can't get them, I'd rather not do the business at all." Over the past three months, Yang's recipes have proved popular, with most of her products selling out by around 3 pm every day. Located in the Zhongshan Park area, Blue and Brown was set up by several alumni of the Raffles Design Institute in Shanghai last September. The restaurant features wooden chairs, tables, bookshelves, and staircases all boasting natural grains and colors. Meanwhile, light bulbs that are half blue and half transparent are suspended from the ceilings casting pale blue halos on the floor and on the surrounding plants. The predominant hues and tones of the interior make it plain where the restaurant name comes from. The restaurant features a special durian menu, including a durian pizza (55 yuan), durian cupcakes (20 yuan), durian coffee (25 yuan), durian milkshakes (30 yuan) and durian cheese fondue (60 yuan). 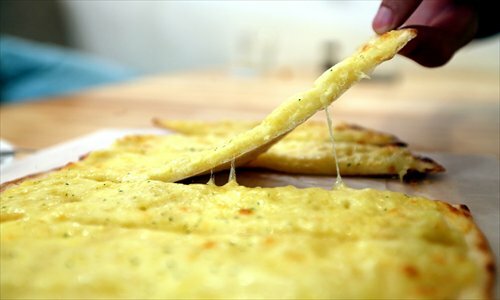 Served on a wooden tray, the pizza boasts a crispy thin base and the fragrant combination of durian and cheese makes it currently the most popular order at Blue and Brown. The durian cheese fondue is only available between September and February, as only mature durians are suitable to be used in this dish. And for a different taste, the durian milkshake is only served between May and November. And to match the durian dishes and drinks, the eatery offers a wide selection of salads which are all accompanied by a mild, homemade sauce. Among the non-durian products available are a variety of drinks including coffees, milk teas, sodas, fresh juices, beers, and yogurt smoothies. Be minded, however, that durian is said to be incompatible with alcohol and may lead to feelings of discomfort. Fans of hit comedy 2 Broke Girls will be impressed by a new cafeteria called Say Cheese and which has been partly inspired by the American TV series. And just like in the long-running show, the pair of owner cousins, surnamed Zhang, also make delicious cupcakes. Set up in July, 2012, the space boasts a cozy and retro feel that includes rusty metal boxes containing bags of sugar, miniature merry-go-rounds, purple sofas, and light bulbs with green plants inside of them. 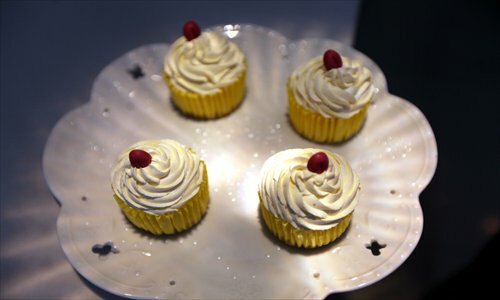 The cafeteria now provides a variety of cupcakes, two of which will appeal to lovers of durian: a durian bomb cheese (35 yuan) and a durian Charlotte (40 yuan). The durian bomb cheese is made by mixing French-made Kiri cheese and Thailand durians, creating a double whammy of pungent odors. Meanwhile, the durian Charlotte features homemade ladyfingers (a type of cookie) as a coating, with a thick layer of durian pulp topped off with a Bavarian pudding. To match with the rich taste of the durian cupcakes, Say Cheese provides a wide range of teas, such as lemon verbena, French rose, and Roman chamomile.